Fisher-Price Bob the Builder Mash & Mold Construction Site Just $8.97! Down From $30! You are here: Home / Great Deals / Christmas Deals / Fisher-Price Bob the Builder Mash & Mold Construction Site Just $8.97! Down From $30! 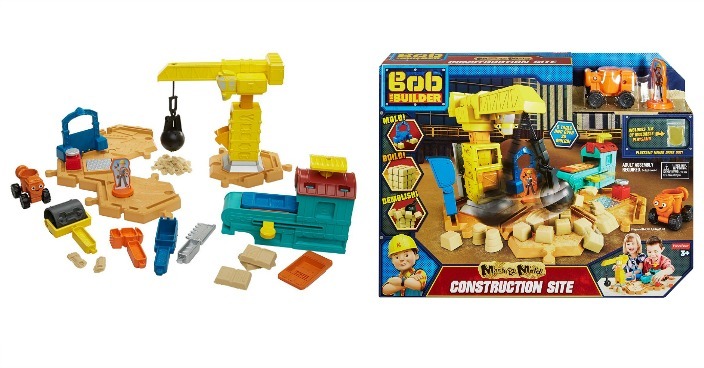 Amazon has this Fisher-Price Bob the Builder Mash & Mold Construction Site on sale for $8.97 (Reg. $30)! The Mash and Mold Construction Site includes four easy-to-use, easy-to-move hexagonal tiles which act as the multi-purpose base of the playset. Each hex base piece can be used to store the mold trays, tools, and they also feature a variety of different construction textures and imprints such as tread marks, gravel, piping, and a sledge hammer! Located right on the construction site is Bob’s mobile mold-press garage which comes with two custom mold trays that each feature their own pairs of textures. Simply place one of the mold trays onto the press, place some Mash and Mold Playsand into the mold, slide the tray in, press the top of the garage, and slide the tray out. Plus, the garage is home to over 9 different molds and textures (including the trays)!